Due to necessary maintenance by our hosting provider this site will be unavailable for a few hours on 1st May from 3pm. It is expected that the maintenance will be complete by 5pm. This entry was posted in Other News on April 23, 2017 by Ian Huston. 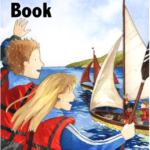 The Sea Scout Book has been an immensely useful source of information for Sea Scouts throughout the years. The book is now out of print so we are making the PDF document available here. The file is here (20Mb) and we also have some information on the topics covered. This entry was posted in Group News and tagged guide, handbook on February 21, 2017 by Ian Huston.